While on board an EasyJet flight, siblings Sakina (24), Ali (21) and Maryam (19) found themselves being escorted off the plane an interrogated by the MI5 for an hour. 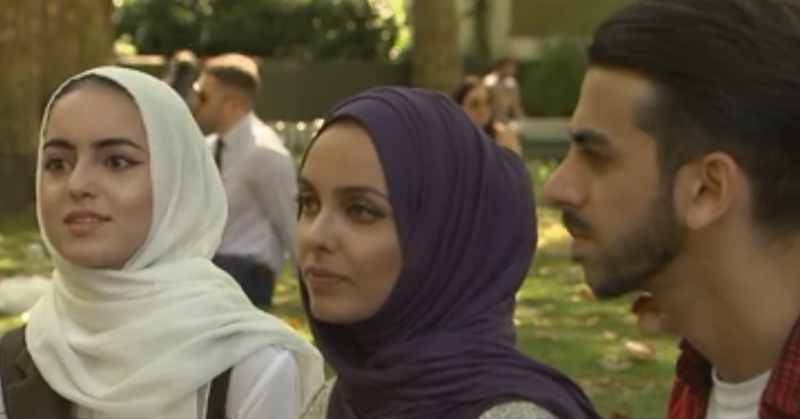 Speaking to AL Jazeera, Sakina, the eldest was told by the MI5 agent that “A passenger on your flight has claimed that you three are members of ISIS,” after two passengers on the same flight as her and her siblings informed authorities that they had been looking at a mobile phone screen that showed Arabic text they deemed suspicious. Sakina revealed that she doesn’t even speak Arabic, and like many of us, the only Arabic in her phone is from an app featuring verses from the Qur’an, which she said, “wasn’t even open” when they were in the airport. Describing the humiliating experience in detail, Sakina revealed that she had to show her recent WhatsApp messages, reveal information about her private life, talk about her social media accounts and even detail where her parents work. Writing on her Facebook page, Sakina spoke about the incident which she says completely ruined her holiday in Italy in further detail and shared her thoughts on what happened. “We’re growing accustomed to it, and desensitized … More education is the best way to battle ignorance,” she said. Now, while Sakina says the Qur’an app on her phone was closed, she went on to question why Arabic as a language has in this day and age become synonymous with terrorism. This raises the question; why do you fear us? Why, when we’re out in the world living our lives just as you are you feel the need to question our motives? This incident is unfortunately one of many we hear too often in a world that preaches religious freedom but fails in maintaining this freedom and making it all inclusive. Sakina also identified that her brother who is lighter than her was not given the same harsh treatment that her and her younger sister, both of whom wear the hijab were subject to. This is also an unfortunate yet all too similar account of events that have been occurring in the U.K. since a vote divided the nation. While we all know the hijab is a symbol of faith and modesty, many others see it as an immediate identifier of Islam which they have been taught to view as evil. With Western media outlets appearing to further the idea that Islam is synonymous with terrorism, the hijab has become a symbol of division and hate to those who do not understand or wish to learn. Incidents, most of which are occurring on public transport are being documented on social media for us to read and recoil in horror at incidents which are far too similar and frequent to that which Sakina, Maryam and Ali became victim to. Racial profiling is an issue for racial minorities everywhere; to be stopped at an airport simply because you look a certain way is a humiliating experience which can, in fact, steer you away from ever traveling again. Sakina ended her Facebook post with one word; sigh. A small, yet all-encompassing word succinctly expressing her frustration at the events that unraveled when all she wanted to do was travel on a plane with her family. Be strong, sista! I am sure that you are stronger than this, In Sya Allah.